–Exclaim! 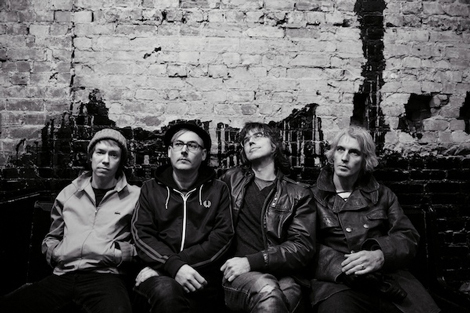 has a new track from Canadian Music Legends Sloan, celebrating 20 years with new LP and the song “Follow The Leader“. –Pitchfork has a track from 13 & God, a project between German electro-pop outfitthe Notwist and avant-rap crews Themselves and Subtle. I’m a fan so far in “Old Age“. -If you’re a fan of Dr Dog, you’re going to probably love The Devil Whale. Check out “Barracudas“. –Stereogum has a new track from TV On The Radio. Thats right, they’re back. Check out “Will Do”. –Gorilla vs. Bear has a live video of Julianna Barwick. Finally, you’ll be seeing a lot of pre-sxsw coverage on this site as I make my picks of who I’d like to see at the festival. You just won’t see any coverage as its happening, as I won’t be going this year. Do512.com (An Austin entertainment site) has put together a page for all the bands that I’ve talked about here that are attending this years festival. With streaming playlists (via Grooveshark widgets) and schedules. I had no idea it existed until I got the e-mail today. Works for me.